Fired. Laid off. Let go. Downsized. Right-sized. These are all euphemisms for unemployment. No matter what you call it, it means you’re out of a job. You may have worked for the same company for decades. It’s a shock to be terminated, especially when you didn’t see it coming. Clients ask me, “Maureen, what do I say to recruiters or hiring managers?” (see scripts at the end of this short article). An entire career of impeccable results and accomplishments are at risk. You are a go-to guy (or girl)—an industry sage. Understand that this is not your fault. You’ve been distracted by a major project that has kept your head down and your team busy. You may not know what the Board had in mind with this decision; you may never know, and it’s important to understand that this is less about you than it is about the company. Be easy on yourself. Do not make major decisions within the first couple of weeks. Know that there are 4.9 million job terminations per month in the US alone. In Canada, the number is slightly under 1 million (however, note the difference in total population). It may feel as though you’re alone in this experience, but you really are not. It’s more common than you may realize. 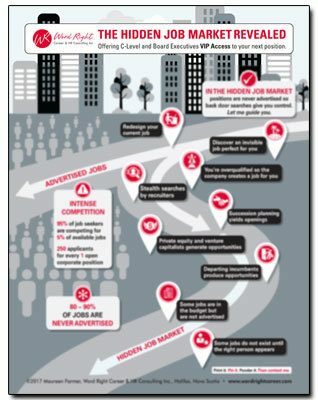 You can lean on an outplacement provider to help you with this transition. Hiring a career strategist can reduce time to market significantly, and you can be market-ready in 30 days. In your dismissal meeting, you likely received information about benefits you will receive. For example, you may receive a severance package — although you aren’t guaranteed it, unless your employment contract specifies it. Fewer and fewer companies are offering so-called “golden parachutes” for departing employees; most are reserved for top-level executives, like you. You need to have your attorney review it carefully. Check your employment contract and consult with an attorney if you are unsure about the terms in the contract. Ask about severance and outplacement assistance. Now is the time to negotiate, but don’t be pressured to sign anything if you’re not ready. Find out what’s available to you. Be specific and clear about what you want. Ask how references will be handled. What will a prospective employer be told if they contact the company? Will the Board provide you with a letter of recommendation? Confidentiality around the terms of the departure is important. What will the organizational announcement reveal? What about the press release? What information and resources do you get to take with you? It can feel difficult to do, but ensure you leave on good terms. Terminations happen. It is difficult to feel vulnerable. Richard St. John claims that success is a continuous journey with his 8 simple but powerful principles. See this 3 minute video on the Secrets of Success. Also, do not wait to begin your job search. The longer you are unemployed, the harder it is to find a new job. Some executives feel they need a “break” before starting the job search. However, taking a vacation is the last thing you should be doing. If you lose your job unexpectedly (with little or no warning), it can be particularly difficult to move forward quickly with a new job search. You may still be mourning the loss of your old job. Take action immediately and start the process of looking for work as though it is a job itself. Understandably you may not want to talk to hiring decision-makers immediately. Prepare yourself for future conversations by getting your executive portfolio together. Conducting corporate research to identify your targeted companies to contact. Working with your résumé writer to update your résumé and cover letter. Putting your résumé together can also provide a boost to your self-esteem as you work to gather your accomplishments. It has been my personal experience that executives land very nicely — most times in a better place from where they came. The upside of being terminated lies in the freedom and time you will have to explore your options. However, do not wait to begin your job search. The average time for executives to find a new opportunity is 240 days. Here are scripts you can personalize for telling friends, family, and interviewers that there has been a change in your employment status. Keep it simple. 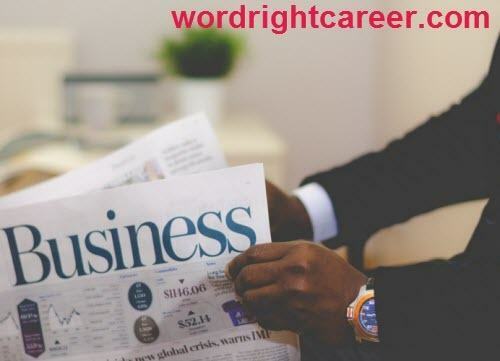 Word Right Career is a boutique firm offering customized executive career coaching services, including résumé building, career branding, job interview coaching, executive outplacement services, and business plan writing. The firm is anchored in Halifax, Canada serving clients globally. If you liked this post, please share it with your friends and colleagues.